The AMS Temporary Ground Panel is an ideal solution for the need to quickly and efficiently create temporary roadways during recovery operations. .
As standard, AMS offers panels in two sizes, 2x1 meter and 3x1 meter. However, panels can be made to customers specific requirements. Each panel is supplied with foam inserts to increase load capacity and eliminate panel movement or "creeping." With an easy to assemble function, many panels can be joined together to increase the distance required. There are no limits to the distance covered. The AMS panel is ideal for both the aircraft itself and the passenger service vehicles that require immediate access to the aircraft after the incident. With the low ground clearance of these vehicles, roll matting is not always suitable as an access road for these vehicles to operate, as they can often ground out, creating a delay in the disembarkation of already distressed and possibly injured passengers. 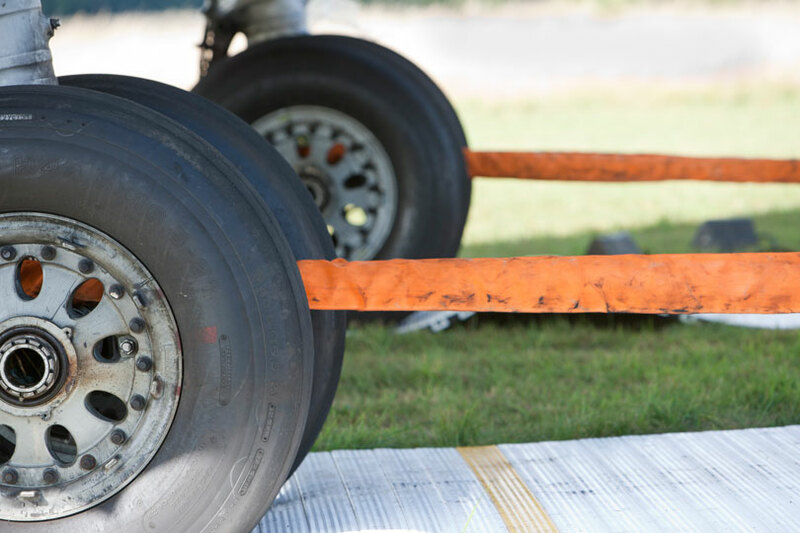 Prior to the recovery operation commencing, the aircraft will require de-fuelling and the cargo will need to be removed in accordance with the aircraft manufacturers recovery manual. The design of the vehicles required to do this task, do not take into account that at some point they may have to operate on soft and often uneven terrain, so these vehicles would also require a surface that firmly supports them during this operation. AMS Panels are lightweight, the 2 x 1 meter panel weight less than 50 lbs. No special equipment is required to quickly create a temporary roadway. The lightweight design also facilitates air transport. 100 square meters of ground cover will fit onto one standard air cargo pallet.